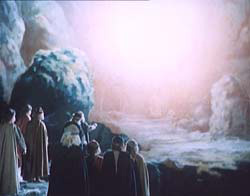 This is a screen version of the epic poem «Kalevala». Black-hearted Loukhi spirited off Annika, sister of hammerer Ilmarinen with the help of a magic cloak. To save his sister Ilmarinen makes the magic mill «Sampo» for Loukhi. Now the people of sunny Kalevala are aggrieved. Annika’s sweetheart Lemminkyainen decides to take «Sampo» from Loukhi but it turns out to be a very difficult task. A lot of awful and tragic events take place before the magic mill’s fragment which Lemminkyainen gets hold of helps to take the sun stolen by Loukhi back to Kalevala’s land. Only after that happiness and love settle here.